For those of you who haven't been around Ten June for very long, David and I are in the middle of a master bathroom renovation. Yes, seriously. It's just super secret, so I've been sworn to secrecy not to talk about it. and lots of glitches along the way. Oh and I can't forget Billy the plumber and Billy the tile guy (check out our gorgeous tile installation here), who helped us along way. The short version of all this is that I promise I'm not trying to hide the ball. But for the last month, David and I have been soooo busy with work and just life in general that we've neglected the bathroom. Which isn't very fun for us because we've been showering in the hallway guest bathroom for about a year now. Yup, awesome. But I've got some gooood news, folks! Bobby came. While I'm still kind of sad that he couldn't hold the tradition and name himself Billy, help has come to us in the form of Bobby, a construction expert who has taken over the renovation of our bathroom. I love him, I really do. I am sad that we can't DIY to the end, but for the sake of finishing this project, I'm all for it. And guess what? As of the end of last week, we have walls. Oh yes, my friends, real ones. 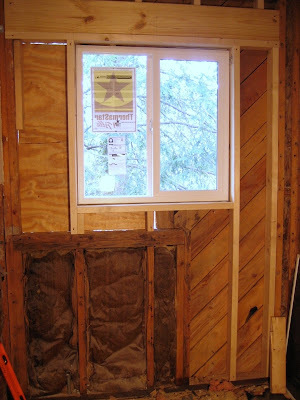 No more exposed insulation or drafty beams. 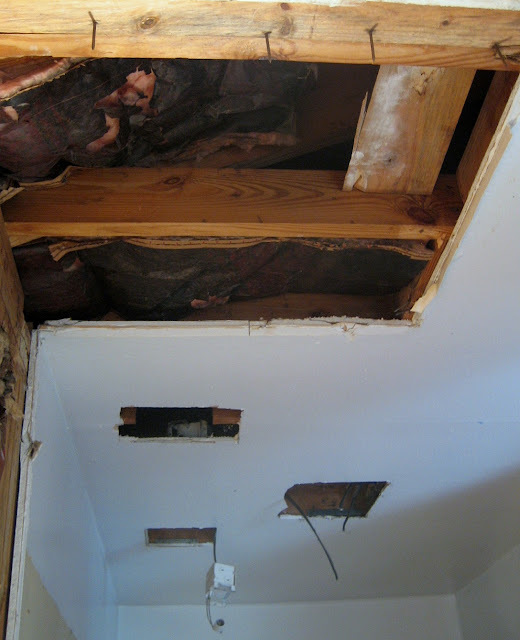 And a ceiling (as opposed to those gigantic holes above). Like, all of the drywall is up, it's mudded and taped and sanded and primed. Major step in the right direction. Here's a little tour of where we are as of last night. I never thought I'd be so excited to stare at a ceiling! So with no promises about how life may or may not get in the way, our next step is hopefully to slap some paint on the wall. I'm thinking a white/gray/blue color that would flow with our connected master bedroom. Have you ever had a project take FOR-EV-ER??? Please tell me I'm not the only one! OMG so jealous. Your making awesome progress!! Also love the blue-y grays. Our Master bedroom is a Blue-ish Gray. It's such a soothing color! And As far as ever having a project take forever... yes. Our showere still is NOT done lol. I just painted my foyer a lovely grey/blue/white....it is behr Light French Grey...I LOVE it!! Pics on my blog. That is going to be one beautiful bathroom! The tile is gorgeous and I LOVE the vanity! Open vanities allow for so much more personalization. I can't wait to see the finished product! We just started out master bathroom this past weekend!! I am super excited and nervous! I definitely don't think you're the only one! Y'all got some SURRRRIOUS work done in there lady! :) Can't wait to see what color you choose! YES! 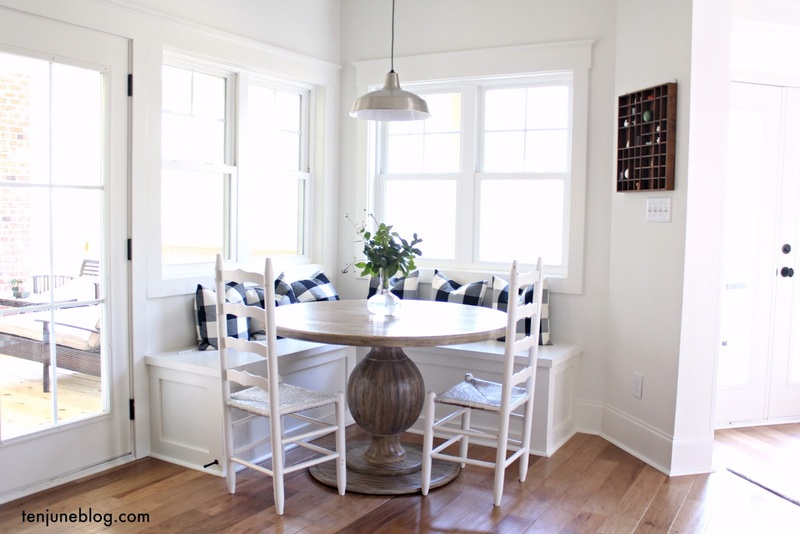 This post made me feel LOADS better about my kitchen renovation that took around 8 months!? and it wasn't even gutted... just new drywall, backsplash, countertops and under-cabinet lighting. 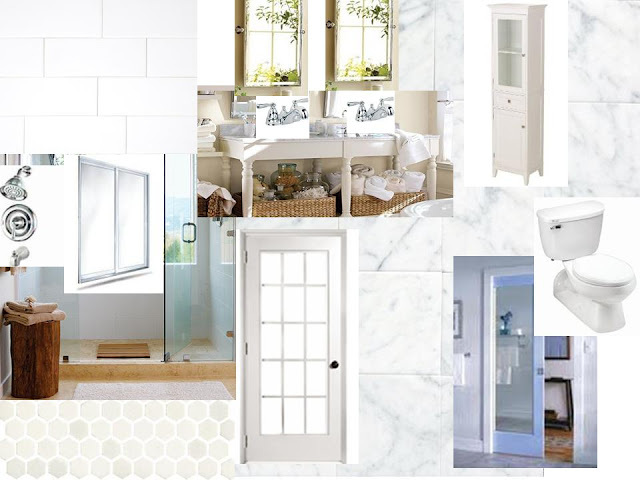 Your bathroom is GORGEOUS already- I cannot WAIT to see the finished project! Thank you so much for sharing honestly about how INSANE DIY projects can make you! Your bathroom is going to turn out so awesome. I am very jeaoulous. I wish we could redo ours. Cant wait to see the reveal. It's looking good! Love the subway tile and tile on the floor of the shower! WOW. It is looking GREAT. :) And,I love the blue-ish, grey paint colors. Gorgeous. I know how great it feels to do something yourself, but sometimes it is just more practical to ask for help! Most of us are crazy busy and sometimes, it just needs to get done to keep your sanity :) Can't wait to see it all finished! projects always take way longer than planned but I really don't feel sorry for you...lol! I am dreaming about your bathroom, amazing! you are building my dream bathroom.. i can't wait to see it finished. It's going to be great! It will be worth the wait. Your blog makeover is fabulous!!! I love it! helloooo? My kitchen is the smallest of redos and I am just not happy with the "finished" look, plus there are minor things that need to be fixed. So I hear yah sister. For what its worth it looks amazing already. love the colors and tiles. It's going to be so amazing!!! LOVE IT!!!!!! It's going to look SO GOOD!!! I can't wait to see!! And you aren't the only one taking their time on a project...my master bedroom started last June and we weren't done until mid February. Life..it happens! All the time!!!!!!! Are you kidding. Sometimes I take breaks for months at a time! In the end it will be so gorgeous. Have a great day. Honey, I still haven't framed those cute papers from Kate's Paperie.... and how little is that job?! It looks beautiful! I love how big the shower area is. Amazing. Don't feel bad about unfinished projects. All of my rooms are 90% done and that last 10% is driving me nuts, but life keeps getting in the way. I've been wondering what happened to your bathroom! We've been using it as inspiration for our in progress bathroom remodel as well! Good luck finishing it up! It looks gorgeous! oh rhondy bear. i am SO pumped to see the finished product of this. Girl, I know how you feel! I have been remodeling a house for several years now! Actually, I have recently blogged about it! Hopefully, will drop by my blog sometime to visit! Looking forward to getting to know you! Don't even worry! We've had quite a few projects take a long time. The wallpaper one from last year took me a while...and I cried more than once. Oopsie. Did you decide on a vanity yet? I still like the one you originally chose! (: You could do baskets with storage or even a little curtain to hide it...although baskets would be my choice. umm i think you have seen my screened in porch progress... dead halt since august. i think we mainly lost motivation entirely... but now we are ready to have it done by easter. ps. might i suggest a paint color. 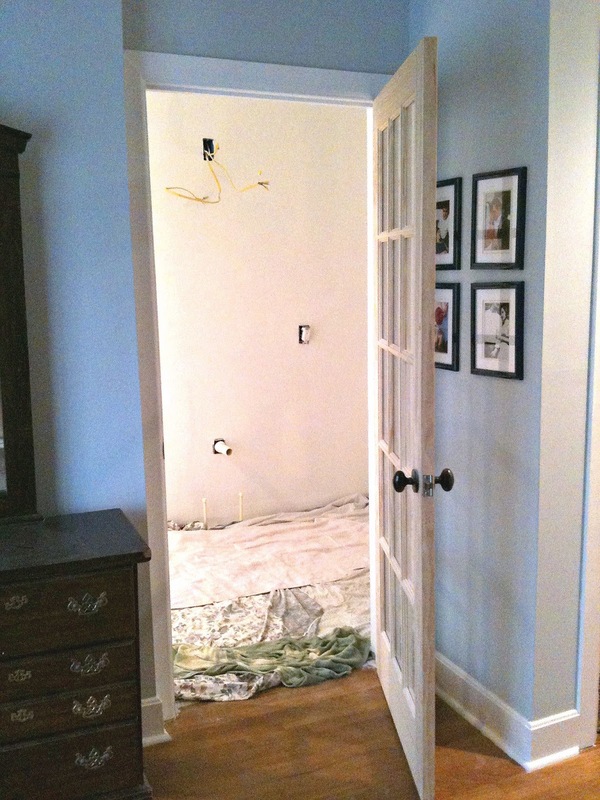 notre dame by valspar (lowes) this is what we did our bathroom in and we LOVE IT. I am blogging it tonight so you can see what the color looks like. hope all is going well. started to email you yesterday about your new blog look and "life" got in the way and i was never able to hit send. looks great!!! mine is "under-construction" right now. Everything in my house is taking a long time, haha! Nothing is done. Sometimes it's hard to build up the courage to make a choice, the funds to buy something or the energy to actually do something once you're ready. =] But your bathroom is looking so gorgeous. So excited for the finished project! Better to take your time than regret what you did too quickly!! This is going to be gorgeous! Loving all the time! I meant tile, not time. I know it was a TON of work, but it looks so, so good! I'm loving that it's bright and airy! It looks amazing! And, yes, every single project big or small takes FOREVER! but your bathroom will be fab...and who's timeline is it anyway?!?!? Love your new blog design! It's beautiful. Projects always take so much longer than you think they are going to, it's going to be gorgeous when you're finished. The subway tile is already a show stopper. Can't wait to see the final reveal. 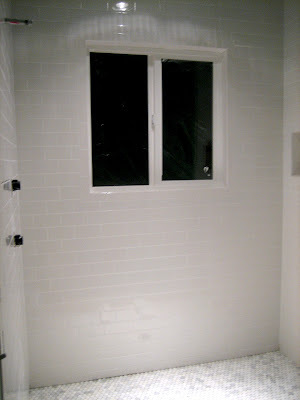 your "subway" tile is exactly like the tile in our actual NYC bathroom. we have the same floors too! way to be on point, mich. can't wait for you to see it in person in august! It's looking so GREAT! And you have WALLS--that means it's, like, a real room now! ;) Can't wait to see the finished result! It is looking great! Things always take longer than expected -- in the end, it will be well worth it! I can't imagine doing all of this myself...y'all are truly amazing!! : ) I can't wait to see the final product! "Crazy bathroom ride" -- worst concept for Six Flags, ever. Love your bathroom! Can you share where you got the hexagon tile in the shower? I love it! We are looking for something identical and can't find it anywhere. I love the pop of color against all the white. Thank you so much!